As part of the Festival of Archaeology we set up our Moor Stories roadshow in the courtyard at RAMM. We were alongside our colleagues from conservation who fascinated visitors with their work on finds from the Princesshay excavations. 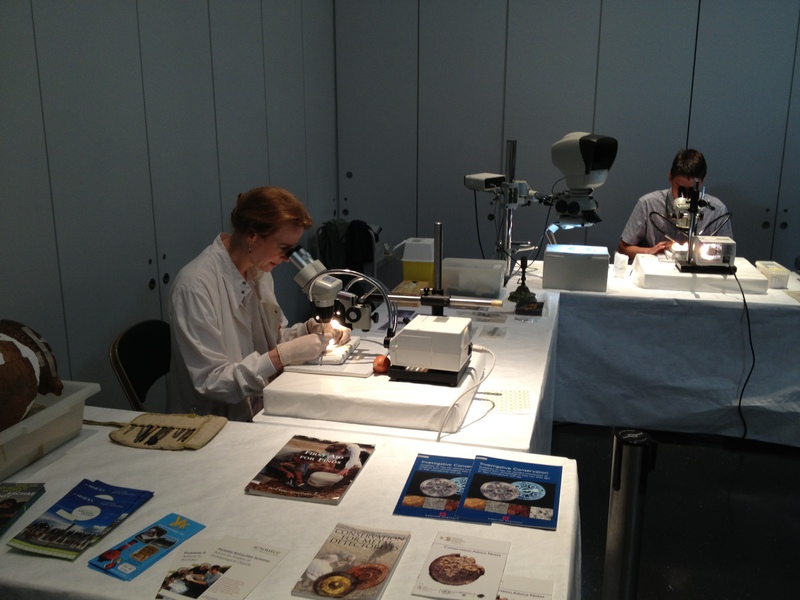 Normally conservation work in their labs but for Festival of Archaeology they set up a temporary lab in the museum. We had plenty of visitors look at our finds from Dartmoor, and being in the museum we were able to display some different objects to the ones we showed at Bellever Day. 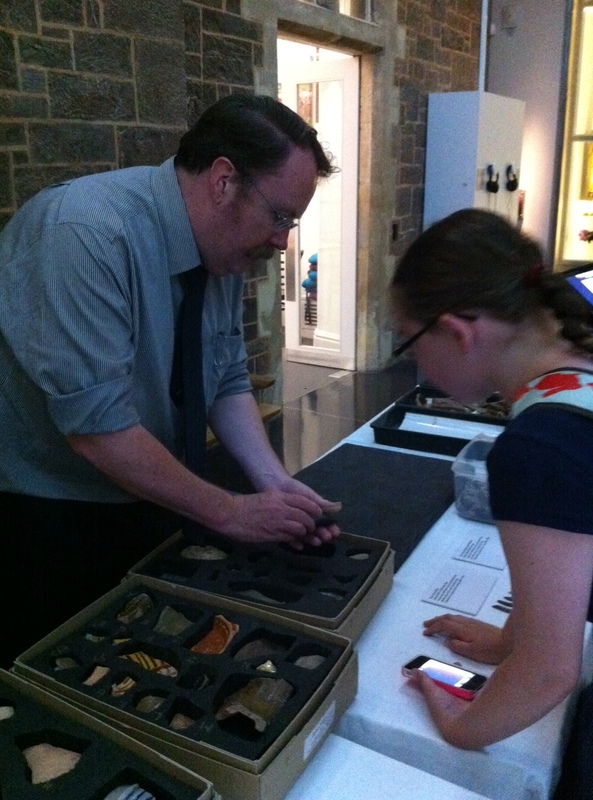 Once again visitors of all ages enjoyed the sort the finds challenge! Our curator Tom devised this simple challenge. 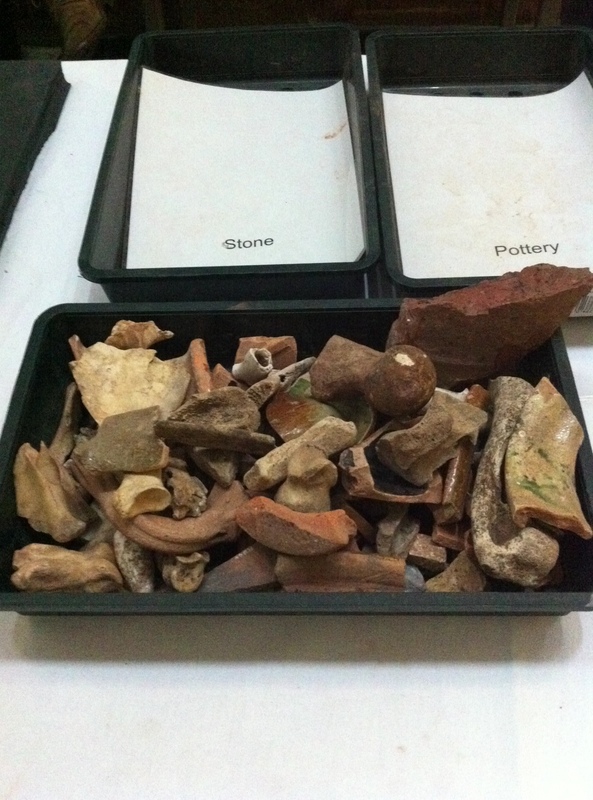 Visitors have to sort an assortment of bones, pottery and stones into the correct categories. There were some very speedy sorters that day! 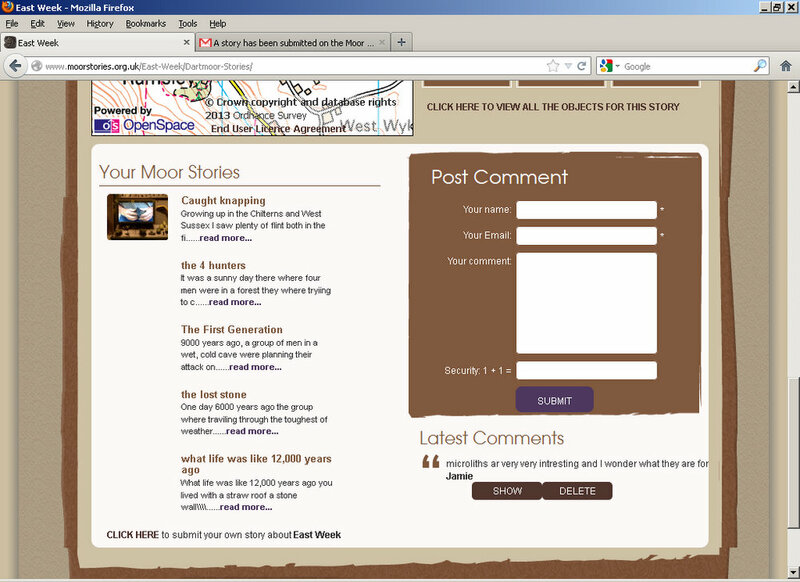 Our visitors were very happy to look at the planned designs for the Moor Stories website and give their opinions. It was an even split between pages with a map of the parishes and pages without. Look for the final design in a future post! My personal research as a PhD student at the University of Exeter aims to examine user engagement, and how this relates to the development of digital content in the heritage and museum sector. The development of digital content in the museum environment, both physically and online, is helping to compliment the traditional text which accompanies most museum exhibitions and the items of interest contained within them, and through thoughtful research and evaluation museums can create dynamic visitor and user experiences which are relevant to an increasingly digitised and interactive world. 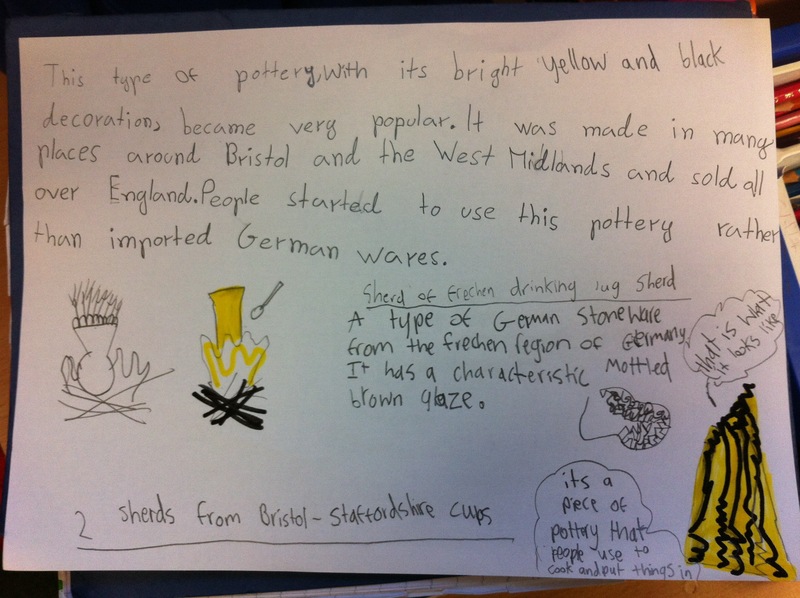 In the spirit of this endeavour, our recent workshop with Ross Sloman and the blue class at St David’s Primary School in Exeter highlighted a variety of ways in which children engage with heritage, and how digital content can help young people create and express relationships with both the physical environment of the past and its material culture. Utilising their own experience of multimedia tools and an impressive use of imagination, the children created not only some fantastic images and stories to publish on the Moor Stories website, but also provided some invaluable feedback which helped us to identify and confirm some good ideas for the continued development of both the Moor Stories project and RAMM’s Exeter Time Trails content. As expected games played a prominent part of the feedback provided by the class, and included a number of thoughtful and interesting ideas which will be considered in our development work. Gaming is an interesting aspect, because well developed interactive features engage a variety of cognitive functions which can educate, challenge and reward children; in addition, it is clear that games are a significant aspect of young user expectations and will continue to play a significant role in both the learning and leisure environments of young people. In terms of environment, the feedback also highlighted the children’s desire to have their own identity on the site, with many members of the group suggesting separate Kids content. Further to this, other personalised elements such as creating your own collection to share with the public, and the development of personally tailored tours showed that both ‘Moor Stories’ and our other project ‘Time Trails’ have a popular underlying theme and ethos. It was also suggested that any tour based functions should be guided, with over 80% of the class favouring maps over instructions, and that both tours and artefacts should be divided into chronological time periods, identifiable themes and object groups. They should also be child friendly, much like text boards in the physical museum which use specific writing techniques. One element of this session was to formulate ideas of how to stimulate audiences in the absence of Tom Cadbury and the objects. The resulting answers provided lateral suggestions of replacing him with more audio and video links. These links could be used in a number of ways, primarily introducing material and asking questions. These questions would not necessarily need to have specific answers but should be aimed at meeting the thinking criteria set by the curriculum, and perhaps also towards older demographics who do not want information fed to them but appreciate guiding stimulus. Visual and audio content is clearly an important aspect in delivering digital materials and represents the move away from a view of literacy that is confined to reading and writing text. In terms of additional visual content, the group felt that the site could benefit from being more vibrant and easier to read. As for audio the feedback suggested more narration, a welcome voice and a theme tune; although it may be preferable to have an optional audio background of music and/or sound to make the site a more immersive environment. Perhaps unsurprisingly, it is felt that ‘Moor Stories’ should have more stories. This of course will be helped by increased use of the site, with users contributing material as hoped. However, in order to make this a definitive ‘go to’ site for those interested in teaching, studying and enjoying Dartmoor, it was suggested that the site should be populated with existing stories or interpretations of folk tales, based upon themes such as myths and legends (as suggested by the class), ghost stories and stories about the people who lived there, both factually based and fictional. 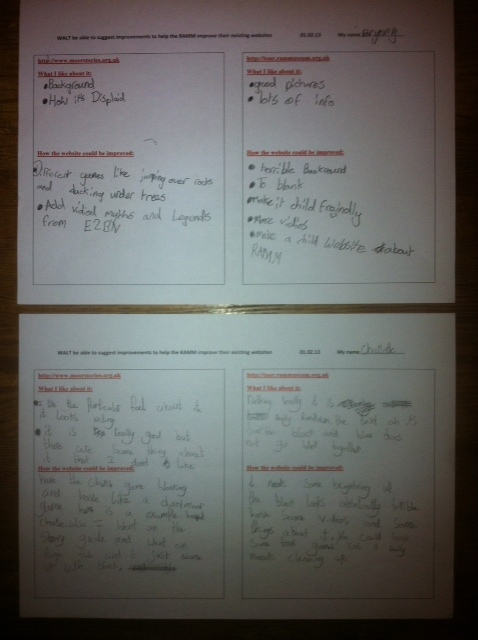 Finally a good look at all the feedback sheets, so generously provided by the class, revealed two suggestions which occurred regularly…Indiana Jones and Hound of the Baskervilles! It would appear that themes of adventure and detective work, based upon popular culture, are desired in order to create an immersive and interactive experience with a recognisable frame of reference for this potential user group. 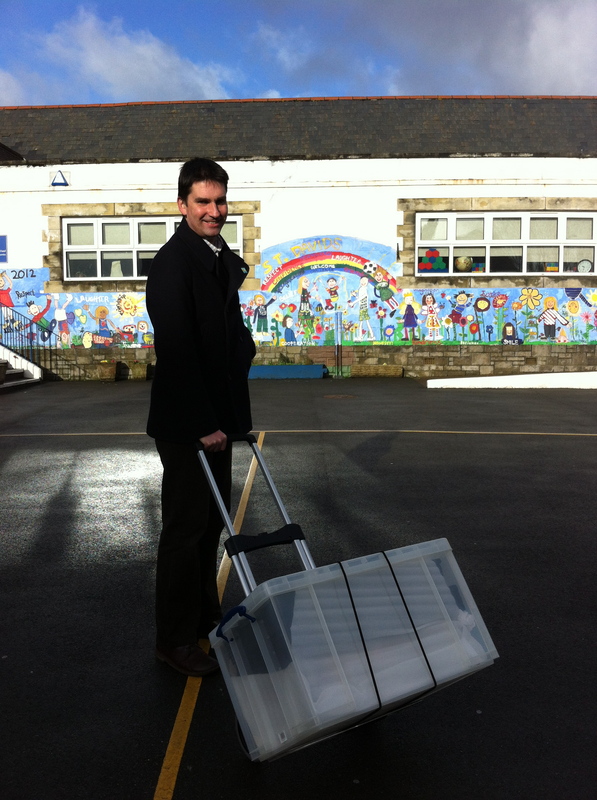 On 14/2/2013 we were invited by Mr Ross Sloman from St David’s Church of England Primary School in Exeter to workshop some ideas as part of the first stage in the re-development of Moor Stories. This first meeting constituted a very important moment in our project as any advice about usability is likely to have a substantial impact on the re-design of the tool. 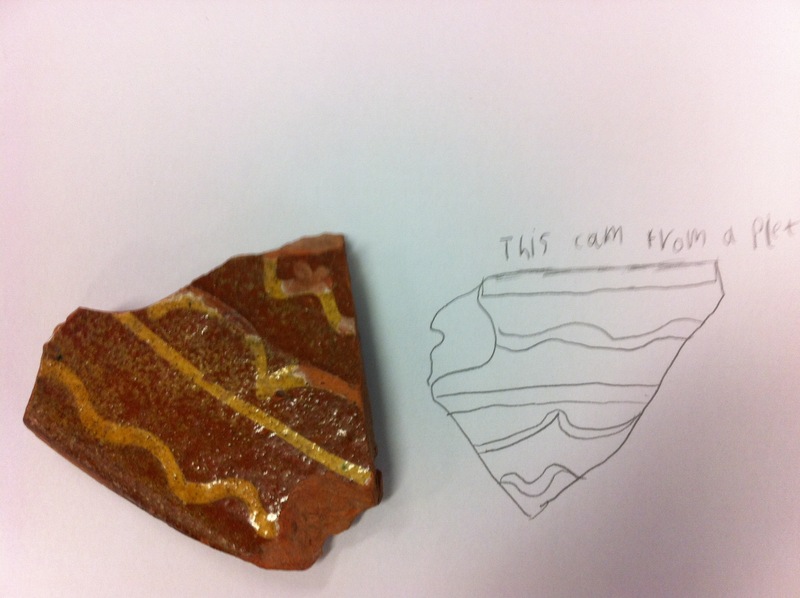 Mr Sloman suggested that we should work with a class of about thirty children spanning 7-9 years (Y3/4) that had previously been visited by an archaeologist from University of Exeter. The class’s name is Blue Class. We walked the short distance from RAMM to St David’s with a box containing all sorts of objects from Dartmoor in RAMM’s collections, stemming from prehistory to the Tudor period, and illustrating the life of hunter gatherers and early farmers. When we arrived at St David’s, the children were sat at five tables, and each table was equipped with two or more computers. You could see, as Tom Cadbury, Curator for Antiquities at RAMM, unpacked the box, how much the children had been anticipating this moment. They were completely focussed, eager to ask questions and very keen to offer good advice about the different elements of the project. I think we all felt very privileged to be in St David’s and very much looked forward to see what such a keen group of learners would make of our work. The workshop started with a talk by Tom about the history of the Dartmoor objects he brought in. He used pictures of people, dwellings, animals, landscapes as visual stimuli to back up to the objects, and talked about how we need to develop personalised relationships/stories with these objects to understand their role in history and hence their value to us in the present day. This idea is a particularly important aspect of Moor Stories which aims to offer users the opportunity to engage with objects in the RAMM collection outside of the museum by narrating stories, drawing pictures or taking videos and photographs of them in the contexts of their own lives. We feel that it’s important that users find novel ways to relate to these objects, and, as far as children are concerned, that free style, mobile learning is facilitated through the tool by offering the opportunity encounter museum objects outside of the museum and self-document the learning experience in a creative way. describe how you personally feel about this object now and what it means to you now that you have touched it and written about it. 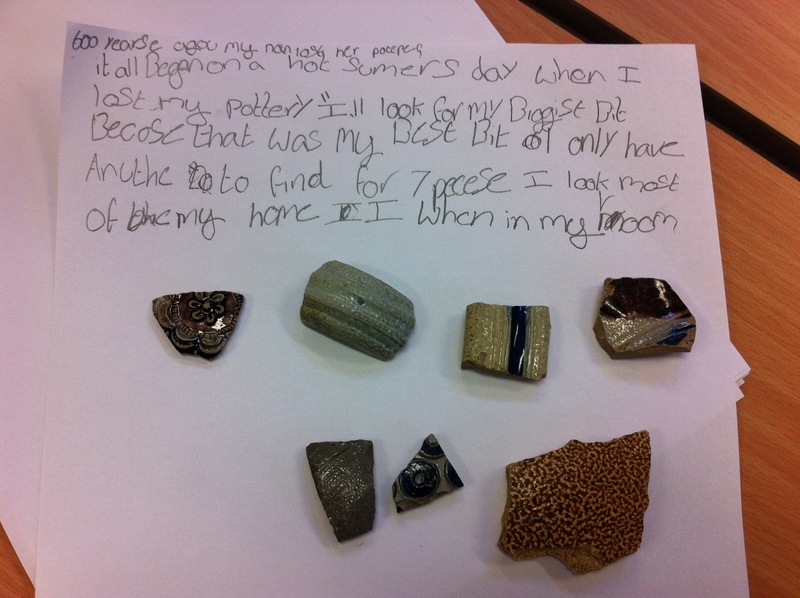 The children could also browse the Moor Stories website, see where the objects they had selected originated from, and what their history was. Each member of the team (i.e., H. Burbage, RAMM; T. Cadbury, RAMM; G. Giannachi, University of Exeter; W. Barrett, University of Exeter), as well as Mr Sloman and his classroom assistant, Mr Glyn Meredith, circulated between the five groups, offering advice on technology (Burbage); history (Cadbury); engagement (Sloman; Giannachi and Barrett); archaeology (Barrett) and creative writing (Sloman and Giannachi). Some of the children worked in groups, some on their own. Some focussed on drawing, and some on writing. They all played, queried and very carefully analysed the objects, whether in relation to the additional drawings we brought in, or in relation to the information offered by the website. We were all amazed at the quality of the detail the children saw in these objects, as can be seen by their beautiful drawings above. We were also very pleased with the way that they were able to associate stories with these objects and subsequently imagined what life would have been at the time. 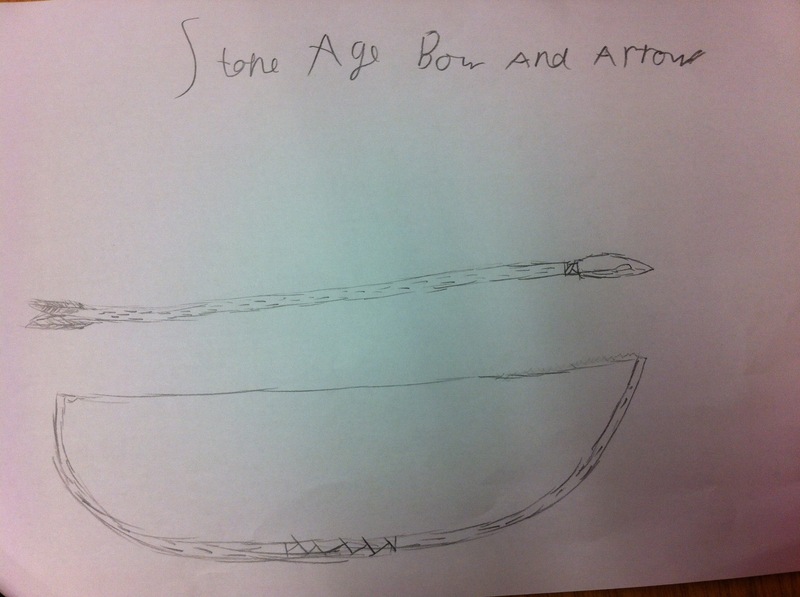 Of the four stories submitted during the session by the children who chose to use the tool, all referred to the East Week section of the site. By imagining how these objects were used in daily life, the children ended up writing about how they thought people lived at the time. The stories are again very detailed, offering data about living and environmental conditions. The stories are fun to read and show a great deal of empathy. Again, we were very pleased with the precision and accuracy with which some of the children developed the fiction around the object. Finally the children were asked to create a short presentation about the work they had done around their object and tell the team what they learnt; whether they’d like to use this tool again and why; what we could do to make the experience more exciting and what we could put on the website that could replace the direct contact with the object and us as real people. As it turned out the children had already, and very efficiently, filled in some questionnaires about this project, kindly also offering advice about a new project that is still at pilot stage called Exeter Time Trail Tours, which will generate a set of tours through history by using the Exeter Time Trail model. Our next blog will be all about that feedback, but we can already say here that there was an appetite for using Moor Stories as a learning tool and that we need to do some more research on the value of empathy in this context. 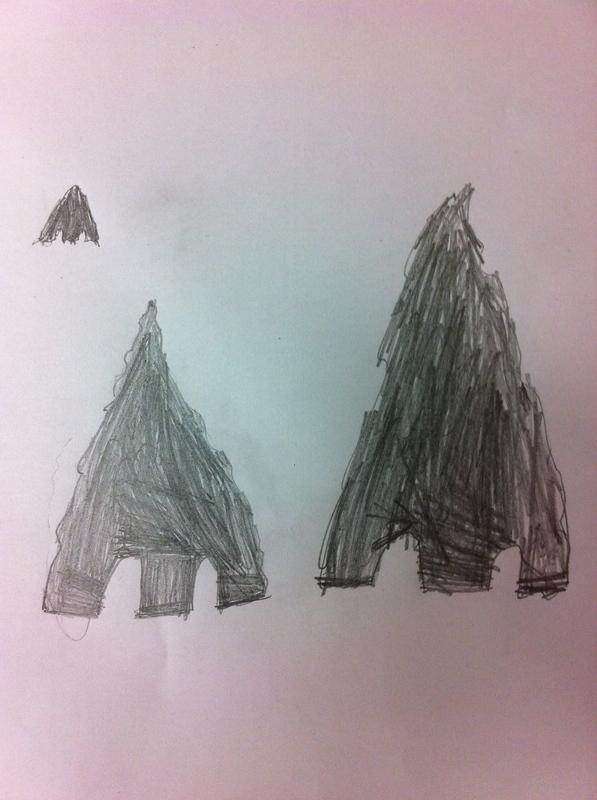 For now, a huge thank you to all the children we met at St David’s Primary School and their teacher Mr Sloman and his class room assistant Mr Glyn Meredith – we look forward to coming back so that you may see how we tried to incorporate your ideas into how the site works. In the meantime, as you can see from the screenshot below, four of the stories are now already part of the growing body of literature that we hope to develop as part of Moor Stories. In 2009, Steve Benford, Tom Rodden, Boriana Koleva and I published a paper at CHI, the most influential conference on human computer interaction, which attracts over 2000 attendees per year from the commercial (Microsoft, Google, Intel etc) and academic sectors from over 84 countries. The paper aimed to offer a conceptual framework in which trajectories explain user experiences that extend over space and time and involve multiple roles and interfaces. The paper won two awards: at CHI, where it received a best paper award, and back in the UK, where it received the best 2009 UK research in human computer interaction award. In short, the paper, which combines performance studies and human computer interaction methodologies, uses trajectories to explain user experiences as journeys through hybrid structures, which can be analysed in terms of: space; time; roles and interfaces. Our research, which was furthered in our book Performing Mixed Reality (2011), presents strategies for the design of these hybrid structures. In terms of space, it looks at how physical and digital environments can be juxtaposed and how users’ journeys can be orchestrated through them. As for hybrid time, it proposes ways of combining story time, plot time, schedule time, interaction time and perceived time. As far as hybrid roles are concerned, it shows how individuals involved in such experiences may be acting as spectators, participants, bystanders or a combination of multiple roles. Finally, interfaces are looked at as interconnected ecologies. The image above shows a user in Blast Theory’s Uncle Royal All Around You (2003) walking through London whilst playing the game, which asks of them that they find the mysterious figure of Uncle Roy by following a series of clues received via a handheld device. Online participants were able to track their progress in a parallel online virtual model of the city. The work was a hybrid experience merging aspects of computer games with live performance. Below, again by Blast Theory, is an image from Ghostwriter (2011) at RAMM. This is an audio tour for mobile phones, which guides users through the museum though a number of possible trails, mixing facts and fiction, and overlaying the physical spaces at RAMM with imaginary and historical spaces. In Moor Stories, we have chosen to utilise a game, an archive and a map to encourage users to explore the Dartmoor materials in the RAMM collections from different perspectives. Space-wise, they can encounter these materials in the museum, where they can view the physical objects guided by museum interpretation; online, where they can experience a broader selection of them digitally, guided by museum interpretation; and in situ, on Dartmoor, through a game and a map, where hybrid physical and digital environments are intersected. Temporally, users can experience these materials chronologically, by exploring Victorian Dartmoor, for example, or geographically, which means objects from different periods in time can be seen concurrently. Users will be able to embrace different roles, the detective (in the game) and the explorer (in the map) and encounter different characters in the game (Hems, a curator and a mouse). This will hopefully encourage users to adopt different roles, which may be more or less explorative (archive, game and map); reflexive (archive and map); playful (game); interactive (game), etc. At our development meeting next week we hope to see how some of these ideas are being utilised concretely in the game and map components of the project. Benford, S., Giannachi, G., Koleva, B. and Rodden, T. (2009) ‘From Interaction to Trajectories: Designing Coherent Journeys Through User Experiences’, Proceedings ACM SIGCHI Conference on Human Factors in Computing Systems (CHI 2009), Boston, MA, April 5-9, 2009, ACM Press. Benford, S. and Giannachi, G. (2011) Performing Mixed Reality, Cambridge, Mass. : The MIT Press.